“A Christmas Alphabet” from Christian Faith Publishing author Barbara Haig is a vibrant, lighthearted experience of Christianity. A rhyming book with each letter of the alphabet illustrated, it allows both children and adults the means to enjoy and learn what it means to live a Christian life. “A Christmas Alphabet”: a lighthearted rhyming lesson of Christianity. 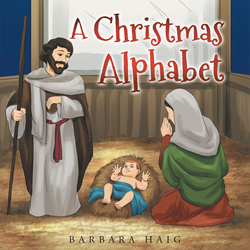 “A Christmas Alphabet” is the creation of published author, Barbara Haig, a former teacher, elementary school librarian in Sacramento. Today, she advocates for literacy for children and helps them decode the written word. “I’m happy to combine my love of literacy and background in theater by volunteering at my local library, reading picture books to preschool children,” Barbara says. Published by Christian Faith Publishing, Barbara Haig’s new book covers both the physical and philosophical aspects of Christianity. This book teaches students of the gospel important biblical locations and events, focusing on what it means to live a Christian life, while blending theatrical elements to create a lively read. Readers will be delighted as they learn important lessons of Christ while viewing vivid illustrations that capture the beauty of many locations, time periods, and ideas. View a synopsis of “A Christmas Alphabet” on YouTube. Consumers can purchase “A Christmas Alphabet” at traditional brick & mortar bookstores, or online at Amazon.com, Apple iTunes store, Kobo or Barnes and Noble. For additional information or inquiries about “A Christmas Alphabet”, contact the Christian Faith Publishing media department at 866-554-0919.